Keats' sonnet ''Great Spirits'' was written 200 years ago in 1816. 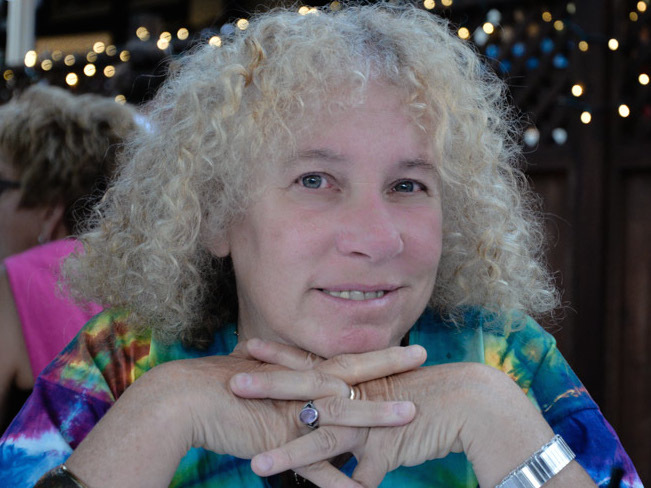 We're celebrating this 200th anniversary with a blog post written by Susan Wolfson, author of Reading John Keats. The quotation is Romeo’s father comparing his lovesick son to a flower thwarted of such birth and blooming (RJ 1.1.148-9). Lover of poetry ever since his schooldays at Enfield, Keats, freshly devoted to poetry after abandoning the medical career for which he had trained since leaving Enfield in his mid-teens, could dream of his own birth into poetry. “Hazlitt’s depth of taste,” he wrote to epic painter Benjamin Robert Haydon, 10 January 1818, was a thing to “rejoice at.” Everyone was reading poetry, talking about poetry, imagining poets as England’s national chorus. Its great spirits and great inspirations weren’t just in the past, but seemed resident on modern earth, with generative power. Haydon embodied Hazlitt’s aesthetic of “gusto” (the title of an essay in The Examiner 26 May 1816) in the flesh, roaring with life and enthusiasm. His rants about art and artists, his vision of grand epic purpose, fired Keats with a sense of greatness stirring in their very age–in Hunt’s Hampstead, in Wordsworth’s Lakes, in Haydon’s London. In November 1816 Keats met Hazlitt at Haydon’s studio, as he was sitting for his image in the crowd of Haydon’s epic canvas, Christ’s Entry into Jerusalem. Haydon, who instantly adored Keats and was convinced of his talent, was fresh and exciting company. Keats visited Haydon again on the night of 19 November, sat for his own image in the crowd, and the two talked animatedly into the night. Later at home, too excited to sleep, Keats poured himself into writing poetry about the heroic vista before him. “Great spirits now on earth are sojourning,” he began a sonnet. He may even have paced it out on his walk home–as he had with another sonnet, just the month before, after reading Chapman’s Homer with his friend and mentor Charles Cowden Clarke. Keats was thrilled at the prospect of being placed, with recognized luminaries, in the crowd of Christ’s Entry. A sonnet for Haydon was the least he could do in return. A sonnet was no little thing in Keats’s conception. He knew how the drama of accumulating phrasings could exceed the piecework of its formal partitions. As he described this momentum in his Epistle to Charles Cowden Clarke in September 1816: “the sonnet swelling loudly / Up to its climax and then dying proudly” (1817 Poems p. 71). This couplet could have closed a Shakespearean sonnet (the Epistle was followed in Poems by a unit of 17 sonnets), but Keats was instinctively resistant to the eighteenth-century mandate of coinciding syntax and line. Enjambment sends his syntax here to the next line, launched with a trochaic inversion, a stressed Up leading to another stress, meta-poetically, on climax, followed by three stresses: then dying proudly. The fall of the couplet-rhyme (we used to call this “feminine”), the rhythmic propulsion of the line against metrical prescription, the thrust of enjambment: this is the very spirit of Keats’s early poetry. Haydon’s epic canvases (and epic self-confidence) energized his actual sonnet-writing with a sense of a cultural momentum. From his residence at 76 Cheapside, the next morning (November 20) Keats messengered a letter with a sonnet over to Haydon. 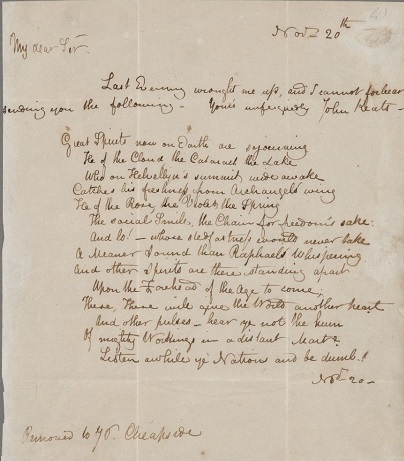 How smart is Keats’s wrought, suggesting a mind and body coiled for action, and sharing an etymology with “wrote”–the two senses perfectively, productively wound up for the sonnet. It looks like genius in the moment and momentum, a fair-copying of what had been pulsing in his head as he walked home, kept him from sleep and exhilarated him for poetry. Listen awhile ye Nations and be dumb.! By November 1816, Keats had already met his political-poetic hero Leigh Hunt, whose mighty endeavors ranged from liberal natural beauties to the courage of taking on the chain for Freedom’s sake—a prison sentence (1813-15) and a steep fine for his oppositional journalism. He thwarted the Crown by reforming his cell into a salon-bower, covering its stone walls with trellis-rosed paper, painting the ceiling into a sky, putting up pictures and bookcases, tending a garden, and hosting a string of visitors, including Charles Lamb, Thomas Moore, and such A-listers as Lord Byron. Keats nicely captures this Huntian double-cross by writing Freedom’s sake with swing of s between the words, so that you hear Freedom’s ache in the principle, the suffering for the cause, and the longing for it. 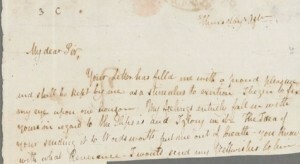 Clarke had been showing Keats’s poetry to Hunt, and Hunt, impressed by the talent, asked Clarke to bring Keats over to visit at his home in 1816. In excited anticipation, Keats virtually inhabited his praise of the sonnet form: “As we approached the Heath, there was the rising and accelerated step, with gradual subsidence of all talk”–swelling up to the climax, and dying proudly at the very threshold of the meeting (Clarke, Recollections 133). This suspense issued in poetic love at first sight. “We became intimate on the spot,” Hunt recalled, “and I found the young poet’s heart as warm as his imagination. We read and walked together, and used to write verses of an evening upon a given subject” (Lord Byron & Some of His Contemporaries  410). Keats’s sonnet gives the headline in its opening words, four stresses on its first six syllables, iambic pentameter succumbing to passionate declaration: Great Spirits now on Earth. The first words code a nod to Haydon’s closing remarks in his essay, “The Judgment of Connoisseurs upon Works of Art … in reference … to the Elgin Marbles”: “the Great Spirit that reigns within them” (Examiner 17 March). Keats arcs the reign into three lines on Wordsworth, not named but coded in the Lake district’s sublimity, a region that seems close to divine, catching Archangelic flight. Then two lines on Hunt pack politics and poetics together. That accelerated volta at 7, And lo! –, hails the immediate inspiration of Haydon with another packed couplet, its “Raphael” designating both a whispering Archangel (the affable visitor to Adam in Eden) and naming Haydon’s heroic artist-DNA (the painter Raphael). Keats’s praise is nicely, tactfully, tactically triangulated through Hunt’s sonnet (Examiner 20 October), “To Benjamin Robert Haydon,” which deemed him “Fit to be numbered in succession due / With Michael, whose idea austerely presses, / And sweet-souled Raphael” (3-5; referring to Michelangelo–yet another Archangel). Haydon is “One of the spirits chosen by heaven” (12) to enlighten the age. This dynamo of company, Keats declares, will regenerate the world, with a new heart, new pulses, and mighty workings (even now, in real time) in marts that can be only imagined on far horizons. The question and exhortation of the two and half lines after line 12’s dash of suspense occupy the place of a Shakespearean couplet, and earn its formal force by other means: Keats opens the question with a verb hear that is visibly wrought from heart, itself anagramming earth, the present scene of esteem. 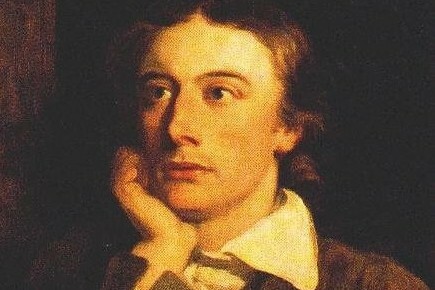 As in his sonnet “On first looking into Chapman’s Homer” (written a few weeks before, in October, and set for publication by Hunt in The Examiner on 1 December, a little more than a week away), Keats images an audience, including himself, poised for awed, reverential silence–necessarily dumb in straining to catch the distant hum. What Hunt had said of the close of “On first looking”–“so energetic a calmness”–Keats bears into another vibrantly suspenseful conclusion. In this suspense, the phrase “Great Spirits” proves more than a two-word echo. It registers as an allusion to Haydon’s full, rolling periodic sentence at the close of his defense of the Marbles: his heroic certainty that their grandeur will gain a “Fame” whose “roaring will swell out as time advances; and nations now sunk in barbarism, and ages yet unborn, will in succession be roused by its thunder, and be refined by its harmony.” Keats’s hum murmurs on this wave across the next line’s “Of mighty Workings,” even as the gerund echoes the octave’s a-rhymes, gathering them for arousal and harmony at once. Haydon responded to Keats’s sonnet with a characteristic complication of generosity and self-interest. Generously, he praised the sonnet and proposed a revision to enhance its drama. Why not cancel the penultimate line (11) after Workings and fill the space with dashes, as if to project the hum of distance, first with this punctuation, then by extension into the page’s blank? Listen awhile ye Nations and be dumb! Haydon was generous, too, in proposing to send the sonnet to Wordsworth himself, England’s most famous in-residence poet, and long a focus of Keats’s vocational inspiration. 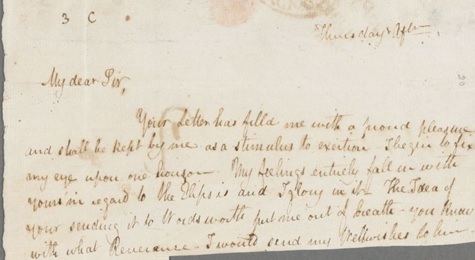 Keats expected that the fresh version he enclosed with the letter would be the one sent. Your account of young Keats interests me not a little; and the sonnet appears to be of good promise, of course neither you nor I being so highly complimented in the composition can be deemed judges altogether impartial—but it is assuredly vigorously conceived and well expressed; Leigh Hunt’s compliment is well deserved and the sonnet is very agreeably concluded. Wordsworth meant that Keats’s compliment to Hunt “is well deserved,” but his syntax may imply reciprocity, that Hunt’s compliment to Keats is also well deserved. 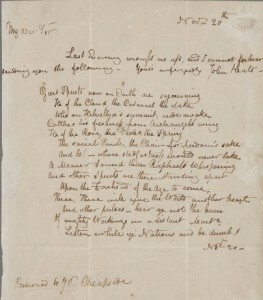 For his part, Haydon must have been pleased by the praise for Keats’s conclusion, and pleased again by the titling of this sonnet in the 1817 Poems “Addressed to the Same” (following “Addressed to Haydon”). “How is Keates, he is a youth of promise too great for the sorry company he keeps,” Wordsworth asked (meaning, in this post-Peterloo year, Hunt, and quite immediately in the painting, Hazlitt). What he could not know was that young Keats was in desperate health, little more than a year left to live. Innocent of this horizon, Wordsworth does Keats the honor of casting him for the company of the “great” spirits his sonnet had honored.